If you have been told that you have Periodontal Disease (Gum Disease) by your dentist you are not alone! According to The Centers for Disease Control and Prevention (CDC), 47.2% of American adults over 30 have Periodontitis or gum disease. Are you asking yourself, how do I know if I am one of the nearly 50% of adults living with the disease? In this article we will discuss the progression of Gum disease to help you better understand what steps you should be taking to keep yourself and loved ones healthy. Let us start with the basics, When you brush and floss do you notice that you bleed? If you do, do you consider this normal? I am sure some of you do, although, I have a news flash for you; THAT IS NOT NORMAL! Bleeding gums are one of the earliest signs of Periodontal Disease. If your hands bleed every time you washed them would you also consider that normal? Odds are you would call your Primary Care Physician immediately to get it checked out. Therefore, you should be picking up the phone to call us now at (970)879-4703. So, you called us to schedule your next cleaning, Congratulations! You are one step closer to achieving not only periodontal health but total overall health! After meeting your hygienist they explain that they will be charting numbers around your teeth to check the health of your gums. Your hygienist will mention to you that they like 1,2, and 3’s as that is what you can reach with your Sonicare and Waterpik at home. Also that anything above that indicates Periodontal Disease and possible bone loss. After charting is done your hygienist will explain what they saw and how together you can achieve overall oral health. 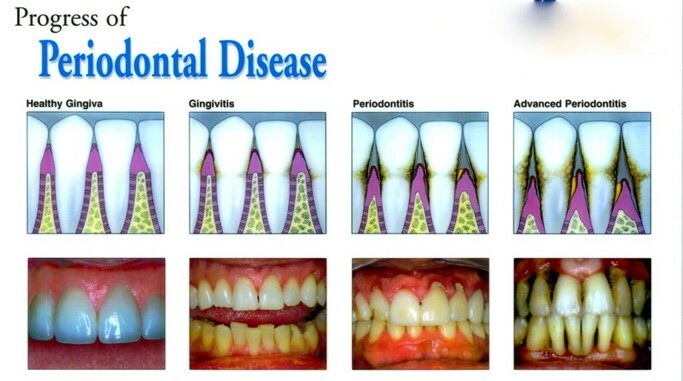 Below we will explain the stages of periodontal disease in association with pocket depths. 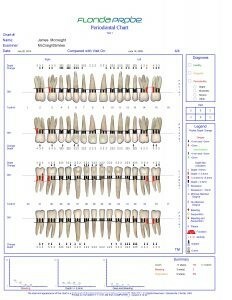 An example of periodontal charting using the Florida Probe technology. Healthy gums have pocket depths between 1 and 3 Millimeters and show no signs of bleeding or irritation. The gums appear pink, fit snugly around the teeth and have no swelling. To measure these pockets we use a periodontal probe. The probe allows us to measure in millimeters from the top of the gum line to the bottom. Gingivitis is the earliest stage of Gum Disease. It is very common and can sometimes go undetected since it usually causes no pain or discomfort. Inflammation of the gums is caused by a buildup of Biofilm (also known as Plaque) which when left untreated hardens into tartar. Once tartar build up starts the only way to combat it is to get a professional cleaning by your hygienist. As the Biofilm builds up it starts to accumulate on the teeth and also on your gums at which point they will usually start to change colors from a pink to a more reddish color. If left untreated it produces toxins that irritate the gums which then usually causes; swelling, receding gums, pain, bleeding, redness and bad breath. At this stage of periodontal disease the pocket depths will start to become deeper usually measuring around 4 Millimeters. 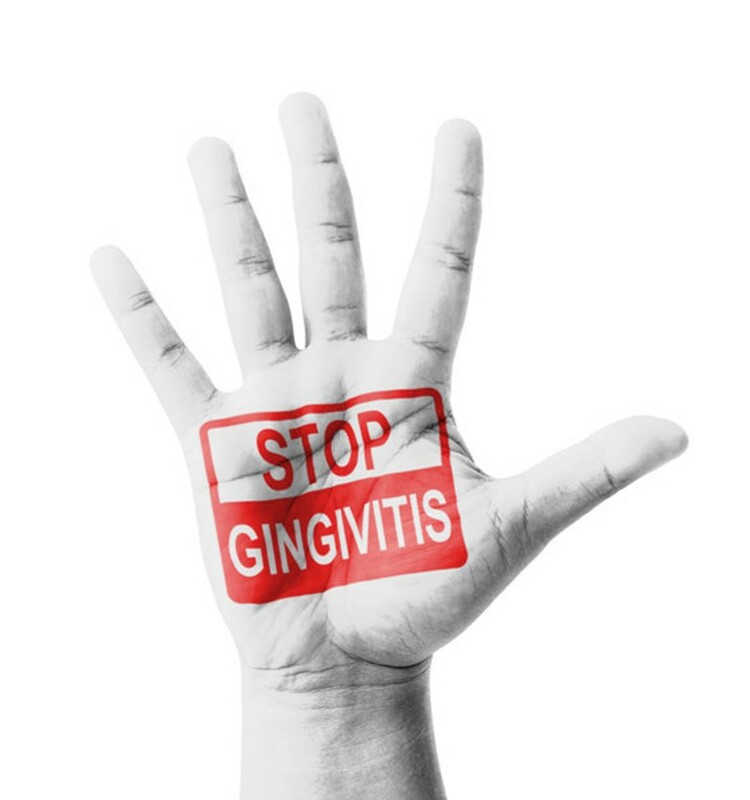 Untreated gingivitis can advance into early periodontal disease rapidly as the bacteria from the biofilm makes its way down the tooth structure and into the gum lines. Clients with early periodontal disease have inflamed gum tissue caused by the toxins produced in the bacteria within biofilm. That bacteria stimulate a chronic inflammatory response within your body at which point the body starts to turn on itself destroying the tissues and bone that support the teeth. 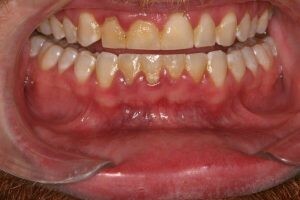 As this happens your gums start to separate more from the teeth creating deeper pockets. Typically at this stage, the pocket depths will read between 4-5 millimeters. Your gums will bleed during homecare and professional cleanings and the gums will start to recede causing an aged smile. During advanced periodontitis the gums are severely infected, excess blood and pus during regular brushing and flossing is evident as a result. 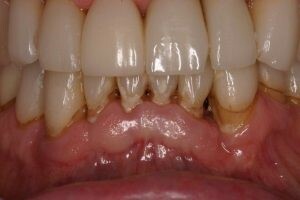 Pocket depths around the teeth at this stage of periodontitis will measure deeper than 7 millimeters. Or roughly a quarter inch! When pocket depths reach these high numbers the teeth often are loose or have fallen out all together. Advanced periodontitis will cause severe pain while chewing, a foul taste, and severe bad breath from the infection. At McCreight Progressive Dentistry we like to combat the bacteria in a cutting-edge way by recommending the use of Perio Protect Trays alongside several non-surgical scaling sometimes referred to as “deeper cleanings” or root planing and scaling. Also the addition of laser therapy with laser bacterial reduction (LBR) using a diode wavelength laser. Perio Protect Trays are a non surgical gum treatment customized to your mouth. The trays deliver medication deep below the gum line in order to aide the fight against gingival infections. They are worn 10-15 minutes a day twice a day and although you cannot cure the disease you can more easily manage it using the Perio Protect Trays. Once you are using the Perio Protect Trays we will start scaling and root planing. During a scaling and root planing treatment the dental hygienist will remove the tartar from above and below the gums. They will also remove rough spots on the root of the tooth where the bacteria (biofilm) like to live. Once we have done multiple “deep cleanings” or non surgical periodontal therapies you will notice less bleeding, less swelling, and overall better oral health. Drs. Wendy and James McCreight along with the McCreight Progressive Dentistry Team believe in prevention which is why our team takes the time during your regular cleaning to carefully chart the numbers around the teeth. By doing this it helps us detect small problems before they turn into major problems. Together we will discuss where the pockets were found and what you can to help us help you. Dr. Wendy and Dr. Jim McCreight along with their experienced team at McCreight Progressive Dentistry offer exceptional dental care for all ages at our convenient Steamboat Springs, Colorado office. If you are looking for a dentist in the Western Slope area please do not hesitate to call us and schedule an initial hygiene appointment (970) 879- 4703.